Tag line: "The Joads step right out of the pages of the novel that has shocked millions !" Trivia: A sequel was in the works at Fox the year after the film's release. The Grapes of Wrath transports us to the Dust Bowl of the 1930’s, when families were forced, by both the climate and the banks, to abandon their homes and hit the road in search of the American dream. Unfortunately, it was a dream many never did find. Based on John Steinbeck’s Pulitzer Prize-winning novel, The Grapes of Wrath opens with former convict Tom Joad (Henry Fonda) making his way home after four years in prison. Upon his arrival at the Joad’s Oklahoma farmhouse, Tom finds the place deserted, and learns from friend and one-time preacher, Casey (John Carradine), that crop failures, brought about by dust storms, have driven most families from the area, pushing them west with the promise of a new life in California. Tom eventually catches up to his family and joins their westward migration, but California is far from the Promised Land the Joads expected it to be. Left with no money and little means to obtain it, they must shuffle from town to town in search of steady work, with hunger and destitution closing in on them quickly. To bring the world of Steinbeck's The Grapes of Wrath to the screen, director John Ford had to put his audience in the middle of that specific moment in American history (recent history at the time it was made, yet a challenge nonetheless). To this end, he recreates not only the tangible, such as clothing and locales, but the intangible as well, the mood and overall feeling of despair these people wrestled with on a daily basis. When he first arrives home, Tom runs into his old neighbor, Muley Graves (John Qualen), who fills Tom in on exactly what’s been happening. In a heartbreaking flashback, we revisit the day Muley and his family were served their eviction papers. At first, Muley refused to leave, promising to shoot anyone who tried to drive him off his land, but once the tractor came, he could only step aside and watch as it leveled the house he'd lived in for so many years. Muley’s wife and kids traveled west with the rest of the families, but he couldn't bring himself to leave with them. This was his land, and, despite the consequences, he wasn’t going to walk away from it. “I’m just a graveyard ghost now”, Muley tells Tom. Sadly, he wouldn’t be the last ghost Tom would meet on his journey; the road to California was full of them. The Grapes of Wrath combines a gloomy, Depression-era story with man's indomitable spirit to carry on, even under the most extreme circumstances. 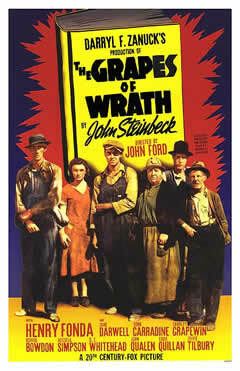 An unflinching portrait of the injustices many decent families were forced to endure, The Grapes of Wrath shines a light on a very dark moment in American history.